Did you know you can use FamZoo to track the repayment of informal loans made to your kids? For example, maybe your daughter needs her own computer for schoolwork right away, but doesn’t have enough money to cover the purchase. You’d like her to repay you over time — maybe by taking a percentage out of her allowance each week. How do you track all that? With an extra account and a goal, it’s really easy. Go to the Accounts page on the Bank tab. Click the Create link in the left sidebar to bring up the Create Account form. Fill in a name like “Computer Loan”. Set the starting balance to a negative number indicating how much your daughter owes you for the loan. If you want to charge your daughter interest, fill in the Loan Interest section with the percentage rate, the compounding frequency, and the start date. You can also supply a cap on the amount assessed each time if you’re concerned about running afoul of some unwritten parental usury law! Go to the Allowances/Splits page on the Bank tab. Hover over your daughter’s allowance or split definition with the mouse and click on the pencil icon to bring up the Edit form. Adjust the split percentages on the allowance to divert some portion to the newly created loan repayment account. Go to the Savings Goals page on the Bank tab. Click the Create link in the left sidebar to bring up the Create Goal form. Fill in a name like “Repay Computer Loan”. Fill in the Amount field to match the amount of the loan — a positive number in this case. Make sure the Account field is set to our new loan account from Step 1. We want to track progress as she moves towards zero (i.e., full repayment) from the negative starting balance, so enter a negative number equal to the initial size of the loan in the Starting Balance Amount field. Click the Create Savings Goal button. 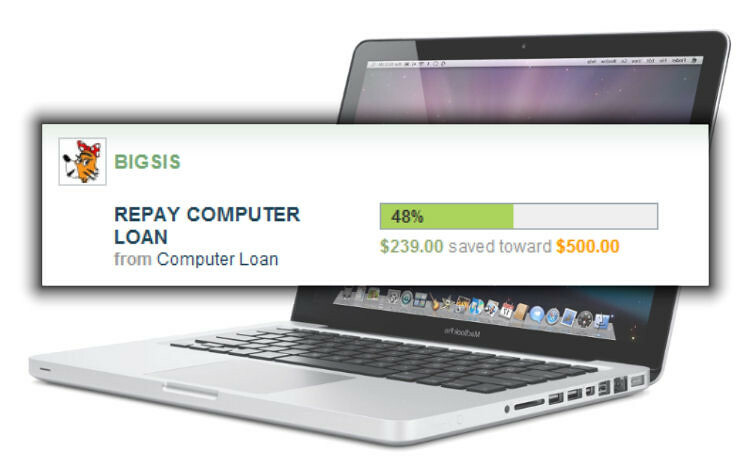 Now we can both see her progress, and we can estimate how long it will take to pay her loan off using the Savings Planner tool. Once the loan account reaches zero, just edit her allowance again and put the split percentages back the way they were to terminate the regular payments. So that’s how you can track informal loans with FamZoo. The loan repayment experience can be a great way to teach your kids the real value of a dollar. The extra bonus is that kids take a lot better care of things they’re paying for week in and week out! As always, if you have any questions or comments, don’t be shy. Contact us. This may be out of date. The "Bank" tab no longer has a "Goals" page. Ah, thanks Bret. You're right. The label under the Viewing links section of the Bank tab is "Savings Goals" and not just "Goals". Just fixed. Thank you for pointing that out. The instructions for creating the loan account are missing the account type, which is now one of the options. Hi Steve, if you're referring to the account Category (Spending/Savings/Charitable) on the Create Account form, that's always been there. People usually just go with the default of Spending. Someday we should probably add a category entry called Loan so any loan accounts could appear in their own group.